In Part 1 of Career Happiness Venn diagram I described the four factors that I believe contribute to how happy or satisfied you feel about what you do for a living and that the potential for happiness increases the more these factors overlap. This framework only describes the macro factors that create the conditions for happiness. There are many other factors that can make what would normally be a dream job into a nightmare: an oppressive boss, an unhealthy culture, a toxic environment, etc. Or the opposite, where the macro factors may not be all there but the people you work with are amazing or you're able to set up the perfect work-life balance. Keeping that in mind, I'm going to stay with the current framework and flesh it out further. Here are the results when I tried to find jobs for me in each section in the Venn. Heart = Love, Star = Do well, Piggy bank = Makes money, Lightning = Makes a difference (icons from Glyphish). As I said in my previous post, how you fill the diagram will be personal. This is how I'd fill it in for me. If you think that this framework has merit and could help you think about your career, I suggest going through a similar exercise. You might learn something about yourself. I know I did. Since I’m unable to find a job for each section, this should technically be turned into an Euler diagram. To understand the difference between a Venn and a Euler, check this out and this one for a bit of geeky humor on the subject. I would love to identify that potential job that meets these criteria: love to do, do well, make money at, but won't make a difference. I have no idea, but leaving that blank is killing me. 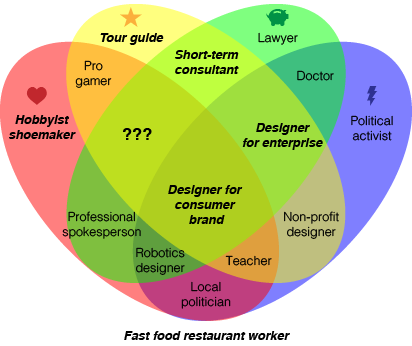 Anyway, the jobs in bold italics in the diagram are ones I have actually had in my life. I was a tour guide for my university's admissions office for a couple years. I got pretty good at it and I credit it with teaching me how to speak to groups of people without (visible) fear and to speak loudly and clearly; these skills have been invaluable to me. A few years ago, I took a very short creative break from work to learn how to design and make leather shoes by hand; being a hobbyist shoemaker is something I really enjoyed and I would like to get back to. I sometimes fantasize about having a little cordwainer's shop in semi-retirement. A more realistic goal is to make one pair of shoes sometime this year so I don't forget how. I've taken a few short-term consultant gigs over the years. I like having a long-term creative, intellectual, and emotional investment in my work, so I can only do a little bit of short-term consulting. I feel like it's a good thing to have on the side, but not as the main course. YMMV as I know a bunch of people who much prefer the short-term engagements because they get bored and/or don't want to deal with corporate bureaucracy. The first 4-5 years of my career was working as a designer for enterprise products. It was intellectually challenging and I learned a tremendous amount, but I couldn't say that my heart was in it; many people I worked with or have spoken to over the years felt the same way, but they've stayed because it is stable and pays well. I pursued the consumer side of things when the opportunity arose, but I knowingly gave up a certain level of job security when I made the switch. Since then, the consumerization of enterprise has been an interesting trend and may make me look back one day. I was a fast food restaurant worker for the local McDonald's that was a couple blocks from my house when I was fifteen-and-a-half years old. I did everything except man the registers: clean the bathrooms, haul stuff in/out of the freezer, take out trash, man the grill, mop the floor, you name it. I believe I made around $3.35/hour which was the minimum wage around that time. I've had jobs consistently since, but that was my only experience working in fast food. I did not enjoy it, but it was the humble beginning of my official work history. I believe many people would consider themselves fortunate to have a job that meets two out of the four factors. I consider myself among those insanely fortunate few who have had jobs which met all four when I've worked as a designer for consumer brands, specifically my current gig doing UX design at Mercedes-Benz, doing new product incubation at Microsoft's Pioneer Studios, and working on Xbox 360. I have become pretty good at UX design, I love doing it, I am paid well, and I believe it makes a difference in the lives of the people I work with, the experience of my customers, and the future of those brands. Not a day goes by when I don't consider myself extremely fortunate to have captured lightning in a bottle multiple times. It doesn't mean that the job doesn't get hard or has failures – it does – but a hard job is more likely to be satisfying, especially when you have moments of success. This exercise became much more interesting when trying to fill in the jobs that I haven't had but could imagine having, and of those, the jobs that meet three of the four factors can be quite compelling. Among the responsibilities I take seriously as a manager is teaching & mentoring. Teaching is one of my plans for the future, but I just don't know exactly what, when, or where that might be. I may need to pursue an advanced degree (and actually finish it) and feel like I'm done with pursuing my corporate career, at least for a while. I do believe that teachers should be paid more considering how much they matter to society and our future, but that's yet another discussion for another time. Maybe I should become a robotics designer who's not very good at it (yet). I could argue that working on autonomous driving and predictive user experiences will eventually give me some expertise. At any rate, I believe that robotics is an extremely important field and, when I am elderly, I will be counting on robots to maintain my independence. I had a difficult time finding an example of something that I would love and make money at but can't do well and feel won't make a difference. I came up with "professional spokesperson", though "futurist" was a close second. I'd happily pitch for Lego, a premium ice cream brand, or a luxury watch brand (who wouldn't?). I have no qualifications and I don't necessarily think that I would make much of an impact, but what the hell.